This khukuri/kukri is issued to Nepalese Army on enlistment and they retain it throughout their army career. It is a part of their armor and well looked after until they retire and a prize possession after retirement. This khukuri/kukri must have played a great part and been a great companion during this long decade of civil war. 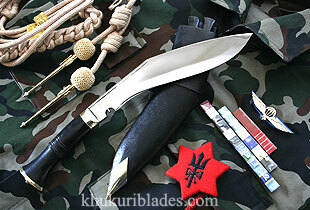 This knife is used on both occasions, for parades (the khukuri drill) and when on duty. Senior officers also regularly inspect this khukuri in order to maintain the smartness and tidiness of each soldier. Nepal Army khukuri is slightly smaller than the standard size as this makes it easier to carry around and can be handled swiftly. It is the simplest of all the khukuris/kukris.